India launched an anti-satellite missile on March 27, 2019. WASHINGTON — The emergence of satellite killer weapons and electronic warfare in space are among the trends that are reshaping the balance of power in outer space and challenging the dominance of the United States, according to two new studies by prominent Washington think tanks. 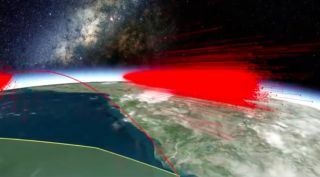 Both released on Thursday, “Space Threat Assessment 2019" from the Center of Strategic and International Studies; and “Global Counterspace Capabilities: An Open Source Assessment" from the Secure World Foundation, build on the research they published in last year's reports and provide interesting new updates. It is perhaps a sign of the times that CSIS sent its report to the printer the day before India fired a missile into one of it own satellites in low Earth orbit on March 27, sending shockwaves across the globe. That just shows how quickly things can change in the space security environment, says Todd Harrison, director of CSIS Aerospace Security Project and one of the authors of the study. The report, based on public sources of information, focuses on four specific countries that pose the greatest risk for the United States: China, Russia, Iran and North Korea. Harrison cautions that this is not a comprehensive assessment of all known threats to U.S. space systems because many of the details about other countries' space weapons are not publicly available. Harrison highlighted a few nuggets of information from Space Threat Assessment 2019 that collectively paint a picture of what is happening in the global space race, particularly the advances made by China. • China surpassed the United States in the total number of space launches for 2018, with 38 compared to 34, and showcased its technological advancements by landing a rover on the back side of the moon. • China's SJ-17 satellite continued testing remote proximity operations in early 2018 around two other Chinese satellites. • China appears to have placed truck-mounted jammers on Mischief Reef in the Spratly Islands in 2018. • In June 2018, Symantec reported a sophisticated hacking campaign from China that targeted satellite operators, defense contractors and telecommunications companies. • Russia conducted its seventh test of the PL-19 Nudol direct ascent anti-satellite system in December 2018 using a mobile launching system. • A picture surfaced in September 2018 showing a Russian MIG-31 fighter jet carrying what is believed to be a mock-up of an air-launched anti-satellite missile. • In September 2018 it was reported that Russia is developing a suspected new co-orbital anti-satellite system known as Burevestnik designed for operations in geosynchronous Earth orbit. • France in September complained publicly about Russian remote proximity operations near a French-Italian military satellite. • Russia has been actively using its electronic counterspace systems to jam GPS signals around Norway and Finland for multiple NATO and allied military exercises, including Trident Junction 18 and Exercise Clockwork in January 2019. On India's recent ASAT test, Harrison said the Indian government had boasted for years that it had a direct ascent anti-satellite capability, but this was the first time it actually demonstrated that capability. "While the test does not initially appear to be as bad for the space environment as the Chinese test in 2007, it nevertheless produced thousands of pieces of debris, some of which may linger in orbit for decades and pose a threat to other satellites," Harrison told SpaceNews. "The test clearly establishes India as a space rival to countries like China and as an important player to be included in future negotiations of norms of conduct in space," he said. The purpose of the test, however, may have been as much about domestic politics as about making a geopolitical statement. In the foreword to the CSIS report, Rep. Jim Cooper (D-Tenn.) argues that the space security environment is a key reason why the United States should have a Space Force as a separate military branch. Cooper is the chairman of the House Armed Services Committee's strategic forces subcommittee and a longtime advocate of a military space service. "The United States is not the leader in anti-satellite technology," Cooper writes. "We had naively hoped that our satellites were simply out of reach, too high to be attacked, or that other nations would not dare." But counterspace weapons are now a reality and the Pentagon "has done very little to reduce this existential risk," he adds. "This is the year of decision," states Cooper. "The president has recently demanded a Space Force. The Pentagon has responded with a proposal and this year's National Defense Authorization Act "will decide the outcome." The Secure World Foundation's "Global Counterspace Capabilities: An Open Source Assessment," edited by Brian Weeden and Victoria Samson, also focuses on advances made by China and Russia. And it includes preliminary details about India's ASAT test after a prior failure in February 2019. Like the CSIS report, the SWF study draws from publicly available information. It includes sections on Chinese and Russian directed-energy weapons capabilities and programs, and on both nations' recent changes to their military space and counterspace organizations. Russian rendezvous proximity operations in low Earth orbit of late suggest they are part of a space situational awareness program known as Nivelir that may be supporting the co-orbital Burevestnik project, both of which may have begun in 2011, the report reveals. SWF found new evidence that Russia may be upgrading the Krona optical space-based surveillance system with laser dazzling or blinding capabilities. The militarization of space is a concern, the SWF report says. "A growing number of countries and commercial actors are getting involved in space, resulting in more innovation and benefits on Earth, but also more congestion and competition in space." More countries are looking to use space to enhance their military capabilities and national security, and are developing counterspace technologies that can be used to deceive, disrupt, deny, degrade or destroy space systems, says the report. "The existence of counterspace capabilities is not new, but the circumstances surrounding them are," according to SWF. There are more incentives to develop offensive counterspace capabilities and greater potential consequences from their use as the global economy and society become more reliant on space applications."